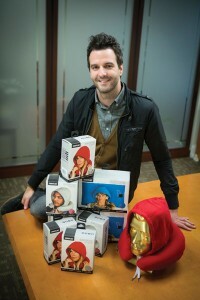 HoodiePillow inventor Chris Hindley ’04 describes his product’s remarkable journey. You created the HoodiePillow after your wife had triplets and couldn’t get sleep, right? Little bit off. I created it for myself. I’d put a pillow under my head, another over my head, pull the blanket all the way up and cocoon myself away to my happy place. That was how I was getting shuteye when the girls were first born. My wife and I are both entrepreneurial people, so we started thinking about creating a product that could solve that problem. We went through eight or nine prototypes where we were changing the hood placement, different options to see how flexible it is while you sleep, comfort. Most people I told about it thought that I was kind of insane. Media members seem to either love it or hate it. Does that bother you? One of the worst things you can have is a product that no one cares about. People have cared about our product, in one way or another, since we launched it. Tell me about Shark Tank. Being on that show [with the Travel HoodiePillow] is the single most important thing that a small product–type company can do. The exposure from news stories is fantastic, but Shark Tank is a 12-minute opportunity to pitch your product to America. Was there a point where the product’s popularity surpassed your expectations? We certainly didn’t expect it to happen the way it did. We launched our website, posted some links on Facebook, and within three weeks the product was on Good Morning America and The Today Show. It put us in a peculiar situation where we had to prepare for an onslaught of orders we weren’t anticipating that quickly. We went into a production frenzy that hasn’t stopped. 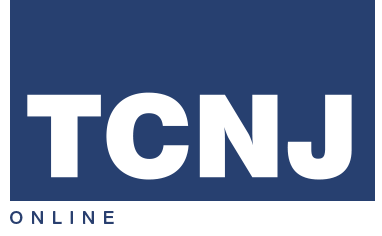 How did TCNJ prepare you as an inventor? I feel my time there, especially in the business department, gave me the opportunity to dive into every aspect of business. As a small business owner, you are in charge of everything, [so] that was huge for me. Any upcoming products up you can discuss? Throughout 2014, you’ll see a launch of four or five other products. So you don’t have to have another set of triplets for another idea? Oh God, no. Three all at once and done.